The Clearing (18 March - 17 December 2017) is a vision of the future in the grounds of Compton Verney Art Gallery and Park. We’re building a living, breathing encampment, in the shadow of the former stately home, where people can come together to learn how to live in the world that’s coming ourway. From March to December 2017, The Clearing will become part school, part shelter and part folly. 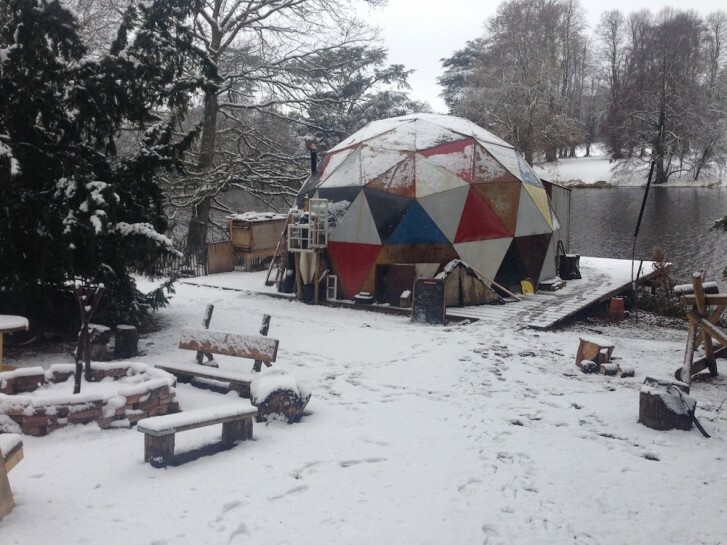 In the middle of The Clearing is a geodesic dome. Inside the dome, a series of workshops will teach you the skills you’ll need once the sea levels rise and the global economy collapses. Outside of these workshops, a series of caretakers will occupy the dome, to chop wood, feed the chickens, and keep the vision alive. The Clearing is a collaborative artwork by Alex Hartley and Tom James. Is it serious? Do we mean it? Is it sad? Is it happy? We’ll find out as the year goes on. Worried about the future? Then come on down. Image: The Clearing at Compton Verney Art Gallery and Park, Warwickshire. © Alex Hartley, Tom James.